LAN parties are usually synonymous with dark basements, 5 dollar pizza, and borrowed Ethernet cables. They always start late, end early, and at least one gamer gets pissed that he couldn't play his favorite game. Girlfriends (for those of us lucky enough to have one) get annoyed that there is nothing for them to do and the idea of spectators is usually a joke. At Studio Elevn, we felt we could kick it up a notch with the first LAN party of our on-going series. PC gaming is the core of any LAN and we made sure to give it the attention it deserved. Tables illuminated with color LED lights designated seating arrangements holding pre-networked and powered locations for each gamer’s rig. We kept things simple for the first party with classic games that everyone has and loves: StarCraft Brood Wars, Team Fortress 2, and Counter-strike GO. Canon 'short throw projectors' created two 150 inch console gaming stations on our infamous Cyc wall with Xbox One S, Playstation 4, and Nintendo Switch all ready for each group to play their favorite games. Wil Bown also made an appearance with his VR set up, giving guests and gamers a chance to experience the latest in the quickly changing tech. Pizza Rolls and Hot Pockets stayed off the menu at this LAN and were replaced with a sushi platter from Simply Sushi, a seaweed-arugula saokolad, and edamame tossed in their house made sauce. Culinary entertainment didn’t stop there, Studio Elevn teamed up with the latest SLC ramen shop, Yoko Ramen, and delivered each gamer's favorite ramen to them at midnight -the most epic gamer snack. 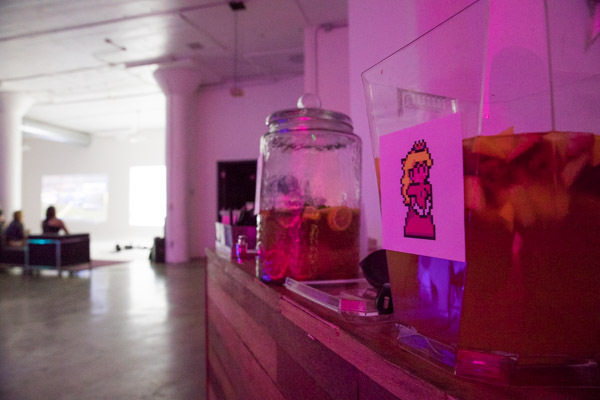 Drinks included gamer themed “One Up” Lemonade whiskey and “Princess Peach” Sangria. If you missed this epic LAN, don’t stress it. Come to the next one and bring friends, it’s going to be bigger and better. Sign up to get informed below.